For a versatile plant that puts on a showy display of flowers, few can top the garden geranium (Pelargonium spp.). Geraniums generally grow as annuals in all parts of the United States, although a few varieties are perennials in U.S. Department of Agriculture plant hardiness zones 10 through 11. Geraniums usually bloom nonstop during the growing season, but you can boost the number of flowers while keeping the plant looking tidy by removing spent blossoms, a process called deadheading. Geraniums bloom in many colors from white to dark pink and bright red. Geraniums produce flower heads that grow at the end of short stiff stems, with each flower made up of five petals and several flowers in each cluster. They generally bloom in spring and summer. To deadhead flowers that have started to fade and turn brown, snip the wilted flowers off the plan with sharp shears, cutting at the base of the thin stem that supports the flower cluster. If petals have already fallen off the plant, you'll see bare stems sticking out beyond the foliage like short spikes; remove these also when deadheading. Clean blades between each cut with rubbing alcohol to prevent spread of plant diseases. Deadhead geraniums whenever you notice faded or brown blooms. If you leave flowers on a geranium until petals fall, the plant funnels energy into making seeds from the remaining flower parts. 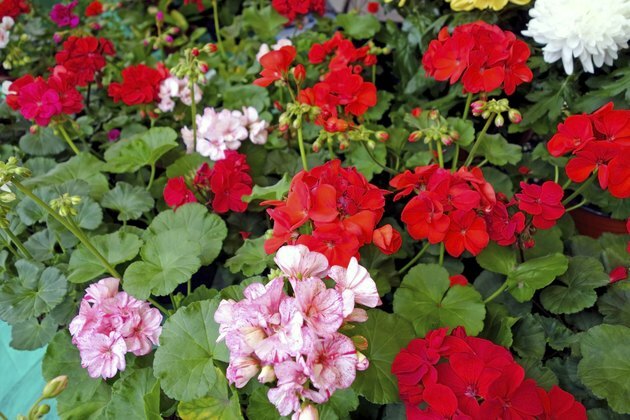 By deadheading geraniums regularly, you'll prevent seed production and extend the length of the flowering season by forcing more energy into flower production. Once you've deadheaded the plant, keep it well-watered and don't allow the soil to dry out completely. Extended periods of dryness can cause leaves to wilt, turn yellow and drop from the plant, which can also deprive the plant of energy needed for flowers. Give supplemental water so the plant receives about 1 inch of water weekly, including rain. It's also important to fertilize a geranium regularly during the growing season so it puts out as many new flower buds as possible after deadheading. In spring, when you plant new geraniums, give them about 1 pound of granular, 10-20-10 fertilizer for every 100 square feet of planted area, mixing the fertilizer into the soil well. To boost blooming throughout the season, repeat fertilization every four to six weeks, watering plants at the base with a water-soluble 10-20-10 fertilizer to prevent disturbing roots. Dilute the fertilizer at a rate of 1/4 teaspoon per gallon of water, but check the product label for additional directions. Help a geranium develop a bushy form that becomes flush with flowers later in the season by pinching or snipping off growing tips on young plants, which promotes branching and spreading of the plant as it grows. As the end of the season nears, dig up and pot garden geraniums to over-winter indoors, bringing them back outdoors the following spring. Trim the plants back so each stem has a few leaves and put them in pots with garden soil. Choose only healthy, insect- and disease-free plants, and keep them in a cool spot with bright light such as a west- or south-facing window. Water the plants well when you first pot them, then keep them a bit dry during winter, watering only when soil feels dry to the touch. How Long Do Pansies Bloom?